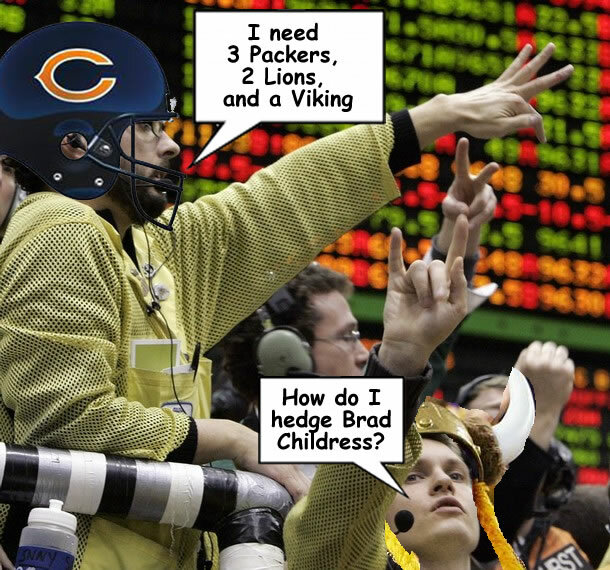 Fantasy Sports as a Hedging Instrument | you like a da juice? One of the main reasons I enjoy fantasy sports is that it allows me a certain amount of control over the emotional impact of a game. The result of a Bears game affects me emotionally, but I have no control over whether the Bears win or lose. Following a tough loss, I can’t say “yeah, I guess it’s my fault. I should have tried to upgrade at quarterback in the offseason.” Fantasy wins and losses also affect me, but in those cases, I have some, but not complete, control over my team’s performance. This makes my fantasy team feal more real than my real team. It’s a fantasy to think that the Bears are mine in any real sense, but it’s a reality to think that my fantasy teams are mine. Nonetheless, I do have favorite sports teams and I am emotionally affected by their performance, which is annoying, since it’s completely beyond my control. One way to reduce this effect, or to hedge my emotional sports risk, is to deliberately avoid drafting players on my favorite teams and seek out players from my least favorite teams. It’s not a strong factor in my decision-making process, but when a marginal decision arises, it can come in to play. Anyways, two weeks later I’m watching the Bears get overwhelmed by Jonathan “The Daily Show” Stewart, while Rodgers leads the Pack to victory over the woeful Detroit Lions, thinking damn, the Bears probably won’t win this division, but whoa, that Rodgers pick was really solid. Without that hedge, I probably would been depressed enough to get drunk and puke all over my bed. But since Rodgers was on, and starting for my fantasy squad, I was only depressed enough to get drunk and throw up on my roommate’s bed. This blog post has powers! Childress has finally benched Jackson…. not that Frerotte is any better. Seriously, why do stiffs who’ve spent time in the league as a backup all of the sudden gain value as backups because they’ve been a backup for their entire career. Signing a lifetime backup qb to be the backup? THAT’S a hedge if there ever was one.